Okay, I’ve done some whining lately. You’ve read my cranky thoughts about how hard it has become to get the wines I like at prices I can afford for everyday. You are invited to shop The California Wine Club‘s Mega Wine Sale before it officially begins. Stock up with savings of up to 65% on award-winning, handcrafted wines priced as low as $7.99. Plus get $1 shipping on every case or half case purchase. See below for more, or click here to shop now! Bordeaux? Nearly impossible. Burgundy? Even more impossible. Bah! But wait! Groundhog Day has come and gone, and this weekend brings Valentine’s Day, a time for love and warm thoughts. Let’s turn that frown upside down and find reason to smile in Italy, where a good, enjoyable $10 wine is still a possibility. Now, before I go all happy-clappy on you, let me clarify: Many of the so-called “Super Tuscans” are still out of the range I’m willing to pay, some commanding three-figure price tags. Many of the fancy Barolos and Barbarescos from Piemonte have crept into fiscal ranges that I reserve for very special occasions. And even some of the big-name Chiantis are now in the realm of wines for indulgence at holidays, birthdays, anniversaries and such. For now, though, let’s just celebrate the continued existence of wines like today’s featured pair, Querceto 2014 Chianti ($10.99) from Tuscany and importer Kermit Lynch’s non-vintage Tintero Rosso ($10.99) from Piemonte. You’ll find my tasting notes below. Speaking of Chianti, in this month’s WineLovers Discussion Group (WLDG)Wine Focus in our WineLovers Discussion Group, we’re seeking the joys of Sangiovese. 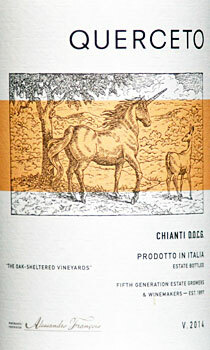 Best known as the great red grape of Chianti, Sangiovese also earns acclaim through Tuscany and beyond. Sangiovese is even grown in terroirs as diverse as California and Australia, although in my experience it fares best in its native soil, whether included in traditional blends or vinified on its own. Feel free to bring whatever Sangiovese you’ve got this month as we taste, compare, and look for great wines and great QPR. Also, in honor of “Open That Bottle Night,” which falls formally on February 27 this year, we’ll devote the entire month to the idea of picking a cherished bottle that’s been gathering dust on the shelf in order to enjoy it … tonight. “Open That Bottle Night,” created in 2000 by Wall Street Journal “Tastings” columnists Dorothy J. Gaiter and John Brecher, is dedicated to making sure that those bottles of fine wine put away for a special occasion are used and enjoyed. Usually set on the last Saturday in February, it is an annual occasion that aims to motivate people to reconnect with each other over a bottle, and create good memories with friends and family. Throughout the month, and especially on Saturday, Feb. 27, if you choose to “Open That Bottle” at any time of day or night, please take a note and tell us about it here. Again, you are welcome to participate either in the WineLovers Discussion Group (WLDG) or on our WineLoversPage Facebook page. You can read the discussion on the forum without registering, but if you’d like to participate in our conversations, you can quickly and easily join the forum via Facebook, using the “Social Login” button at the upper right corner of any forum page to log in. I look forward to seeing you in our wine social media. Welcome! 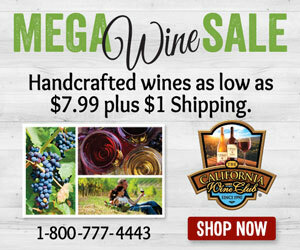 You are invited to shop The California Wine Club‘s Mega Wine Sale before it officially begins. Stock up with savings of up to 65% on award-winning, handcrafted wines priced as low as $7.99. Plus get $1 shipping on every case or half case purchase. Shop early for best selection. Be sure to check out the Super Savers category for the best values. Mega Wine Sale ends on March 31, 2016. Half, full and/or mixed cases all ship via ground for $1. FOOD MATCH: We enjoyed it with a simple take on Marcella Hazan’s Ragù Bolognese. The back label suggests “soups, cold cuts, white meat, medium to hard cheeses,” and recommends serving it cool, not chilled, ideally at “cellar temperature” (55F). To achieve this without a cellar, simply pop the bottle in the fridge for 30 to 45 minutes before dinner. WHEN TO DRINK: I don’t know that it will improve with age, but it’s in a perfect spot for enjoying with food right now. It won’t go around the bend in the next year or two, but – especially since the vintage isn’t given – I’d buy it and drink it when I find it. An exceptional table wine in a price range where such a thing is no longer easy to find. Wine-Searcher.com reports an average $10 retail price. Kermit Lymch Wine Merchant, the importer, has an info page on Elvio Tintero, the producer, at this link. 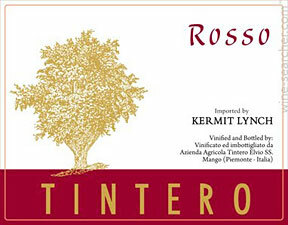 Find sources and compare prices for Tintero Rosso on Wine-Searcher.com.